I play an executioner—a “dishonest” man. 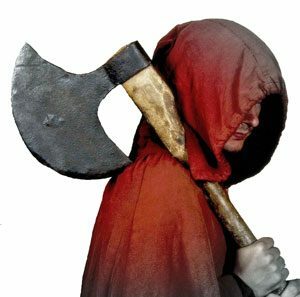 The executioner describes how he became one, his work and his on-going, unsuccessful attempts to find a woman who will marry him. The friendly executioner also sells magic amulets and potions. He’s fearful of witchcraft, devil’s work and living dead. The tour to the enchanted locations of Rothenburg doesn’t require the eeriness of the dark. After all, people were also superstitious during the daylight. he is a healer and has the privilege to cut off the fat from the body of an executed convict. there are magic plants growing under the gallows, and why the mandrake cries when you dig it up. You’ll also learn the story behind the ‚executioner’s meal‘ and what were considered ‚lucky executions‘. You’ll hear the fearful tales of ‚damned executions‘, the return of souls as “Poltergeists” and even of the living dead. And who could forget the legends of the ‚Headless Horseman‘ and blood-thirsty vampires? The public tour on 13.12.18 is cancelled. From April to December the tour starts daily at 7:00 pm and lasts until 8:00 pm. During the chrismas-market the tour starts at 7.15 pm. It begins in the Marketplace (Market Square). Registration or an advance booking isn’t necessary. The tour need minimum 4 people. SPECIAL TOURS for groups: You can also book a private tour and meet your own ‚personal‘ executioner (Price: 83 euros / Meeting point: Market square).